“Is there a way I can make my favorite pasta dish healthy?” A spiralizer can do just that. Ever heard of one? These innovative kitchen contraptions can turn fruits and veggies into delicate noodles that are full of vitamins and minerals. This culinary gizmo has a razor sharp cutter mechanism that slices and dices fruits and vegetables into the most perfect nutritional noodles. Right off the bat, you’re cutting carbs. 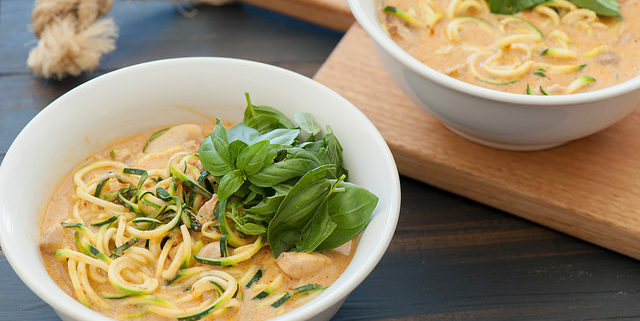 Consider incorporating spiralized squash or zucchini in your next spaghetti recipe and see how it turns out. You might find that you don’t miss the noodles as much as you thought you would. Saves time. Instead of waiting for water to boil, and for the pasta to reach the perfect “al dente,” all you have to do here is put your veggies in the spiralizer, and your noodles are ready. Getting more fruits and veggies in our diet. A spiralizer incorporates nutrient-rich food into our life in a sneaky way. You would be surprised that an entire apple or two zucchinis make up the spiral noodles in your favorite dish! Adheres to different food lifestyles. A spiralizer aids in the preparation of a ton of different recipes that are vegan, paleo, and gluten-free. Ready to cut the carbs for good? You can check out our personal favorite spiralizer on Amazon, or check out some of the internet’s top-rated choices before making a decision. After your new toy arrives, swing by the market pick up your favorite fruits and veggies and give some of the recipes a try. Comment below and let us know how they turn out! Photo Credit: Jules. Licensed under CC BY 2.0. Life gets crazy. We are pulled in so many directions personally and professionally, and it can lead to our least favorite “s word”….stress. When anxiety and worry take over, it’s all too easy to pick up our favorite comfort food and load up on the sugars and starch. Unfortunately, our cravings take more of a toll on our bodies and stress levels than you may think. So the next time you are feeling overwhelmed put down the doughnut and consider some other options. Any fruit is a great decision because they are rich in antioxidants that boost your immune system and your well-being. 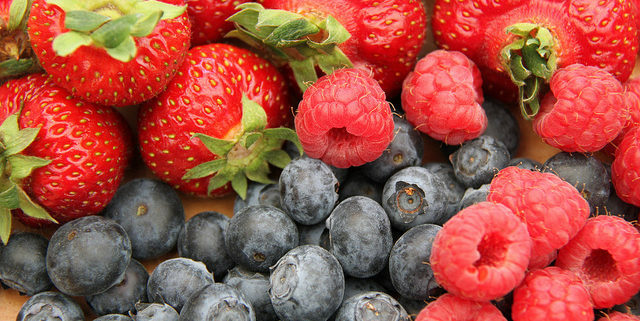 But strawberries and blueberries play a particularly important role in stress reduction. Strawberries: When we’re stressed, sometimes all we really want is a savory, sugary treat. Well, strawberries can satisfy this need, without the negative health effects. Strawberries are also high in magnesium which has been proven to play a complex role in keeping levels at a desirable rate in our body. Stress can lower these levels, and the lower these levels become, the more stressed we will be. Strawberries balance everything out. Blueberries: This superfood is a power-packed fruit with a ton of benefits for your body. When it comes to stress, these guys are full of free radicals that directly combat stress. To seal the deal, blueberry fans are getting a boost of natural white blood cells that help with immunity, which is important for fighting stress. Pick-Your-Own Strawberries season begins in early May and will continue through the middle of June. Pick-Your-Own Blueberries season begins late June and continues through July. Milk is a great source of Vitamin D. Studies have shown that reduced levels of Vitamin D have led to an increased risk of panic and depression. Drinking more milk can certainly reduce this risk and put your best face forward. Warm milk can enhance lowered stress levels by helping to relax the body through its protein lactium, which lowers blood pressure and potassium and relaxes muscles. Pick up milk from our market. We carry Trickling Springs Creamery products, from a local operation in Chambersburg, Pennsylvania. This dairy farm was founded in 2001 and is certified organic, with grass fed cows and is non-GMO verified. If you’re feeling a little edgy lately, make a few changes in your diet to combat the stress. We have plenty of stress reducing products at Orr’s to get you started! Come by to see what we have in store! Photo Credit: Susanne Nilsson. Licensed under CC BY 2.0.